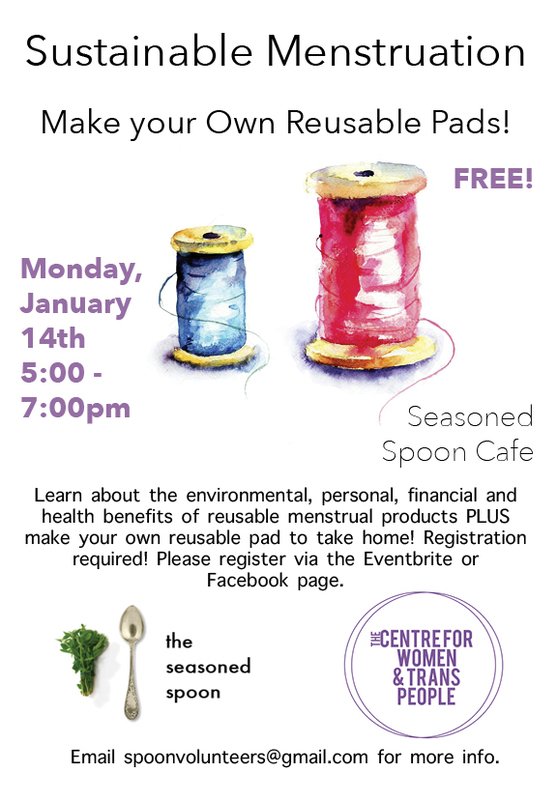 Join the Seasoned Spoon Café, The Centre for Women and Trans People and Maureen Brand from Garden of Eden Reusables for this hands-on workshop all about Sustainable Menstruation. Learn about the environmental, personal, financial and health benefits of reusable menstrual products PLUS make your own reusable pad to take home! Menstrual pad expert, Maureen Brand, will walk participants through different stages, methods and materials to make their own menstrual pads and each participant will get to bring one home. We’ll discuss upcycling materials for future pad projects, as well as care and maintenance of your new pads! Materials will be supplied, but feel free to bring some of your own along as well. Repeats every week every Monday 3 times except Mon Nov 26 2018.
paraben free. A treat for the hands &amp; body, or a great seasonal gift idea for family and friends! oils, add fragrance, and mixing in other additives like oats or coffee grounds. Only 20 spaces available in this popular workshop so don’t miss out! Email spoonvolunteers@gmail.com for more information. 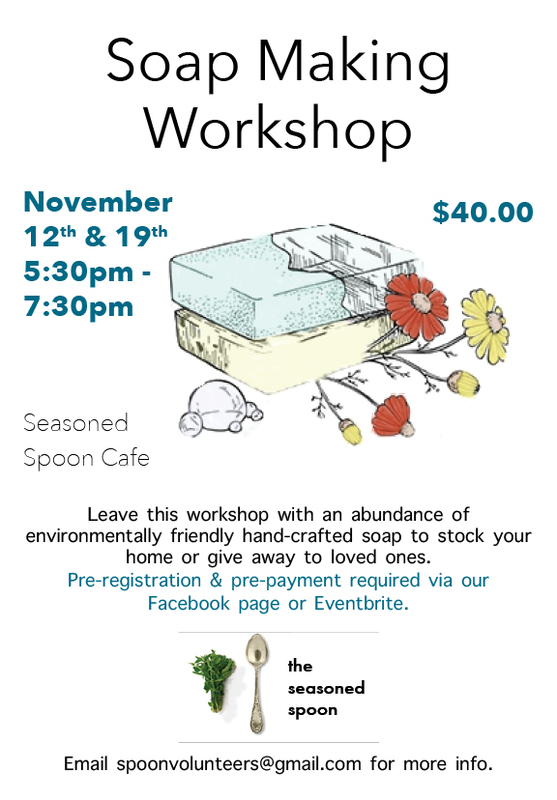 Join the Seasoned Spoon Café and Nourish Project for a community meal and participatory photo project on Guaranteed Basic Income. Imagine living in a society in which everyone was guaranteed a basic minimum income sufficient to live a happy, healthy and dignified life. Well, that’s what the Basic Income movement is all about and we want to hear from you about what that could mean in your life. 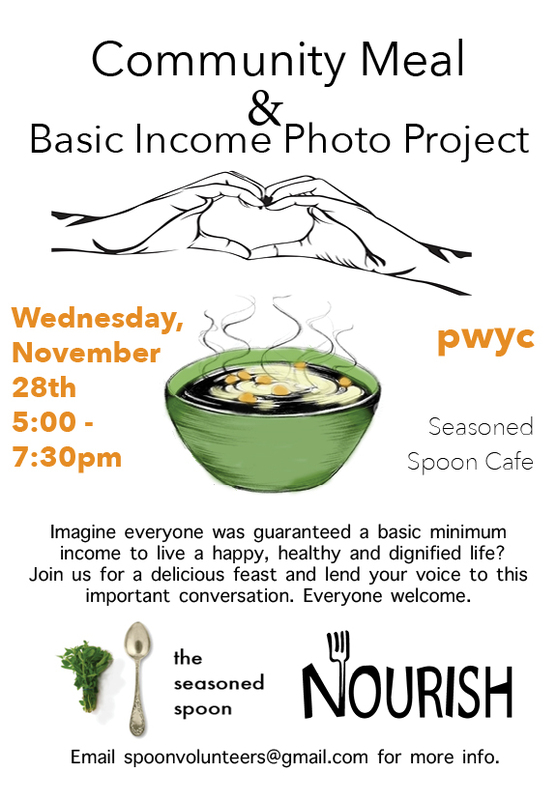 Nourish Project will give a short presentation about basic income, after which you will have the chance to participate in the hands-on photo-booth project throughout the evening. Feast with friends on delicious local foods and give some thought to the potential this critical social assurance holds. Document your insights in our photo-booth and lend your voice to this important conversation. As always, Seasoned Spoon community meals feature fresh campus grown foods and are open to everyone on a pay what you can basis. Hope to see you there! 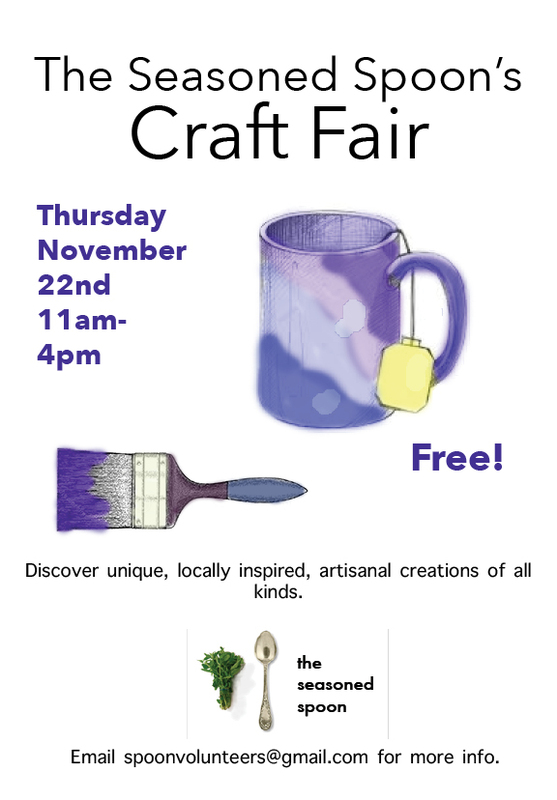 The Seasoned Spoon is pleased to announce the return of our fall Craft Fair. A wonderful occasion to treat yourself, or to pick up seasonal gifts for family and friends. Come by the café and discover delightful, unique, artisan creations of all kinds. Join in the fun, get inspired, support local artists! 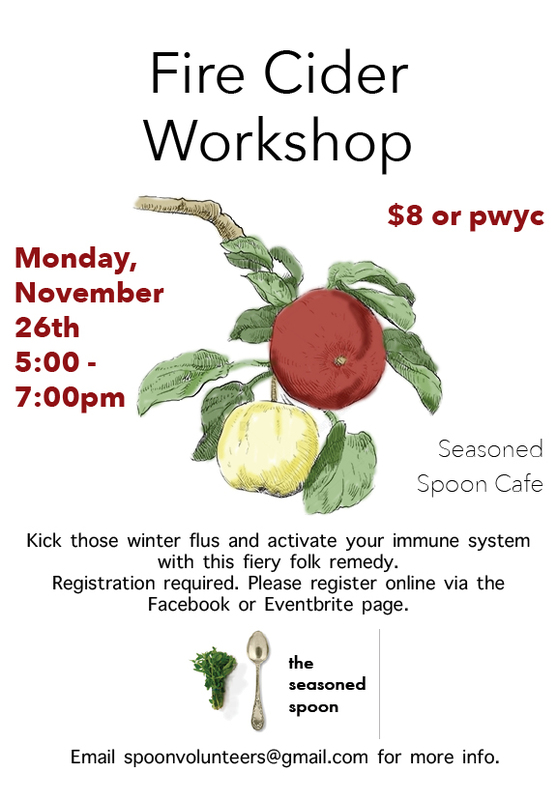 Email spoonvoluntreers@gmail.com for more info. 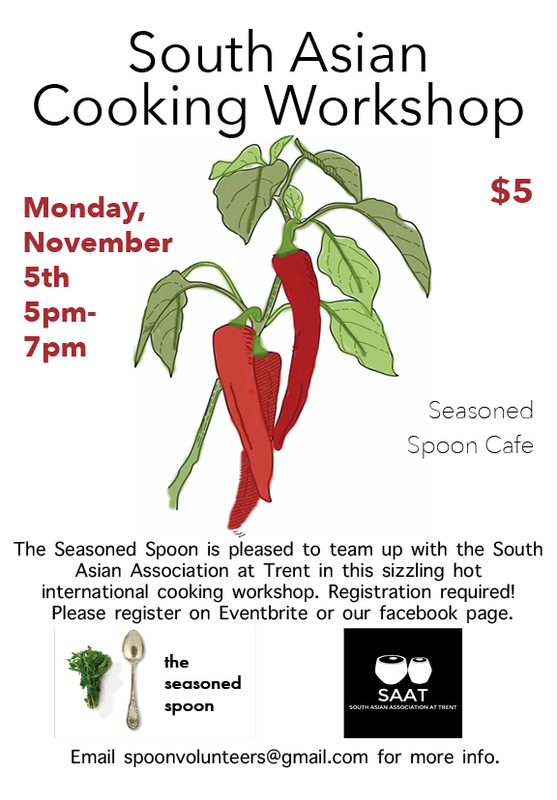 this sizzling hot international cooking workshop. SAAT will lead us in cooking and sampling a few delicious dishes together. Participants will also get the opportunity to learn about traditional spices and even take some recipes home. “What is sauerkraut,” you say? Sauerkraut is a way of preserving cabbage and various other vegetables using a natural laco-fermentation method which actually increases the nutritional value of your food and is full of probiotics, just like yogurt or kombucha! Oh, did we mention, it’s also extremely delicious! 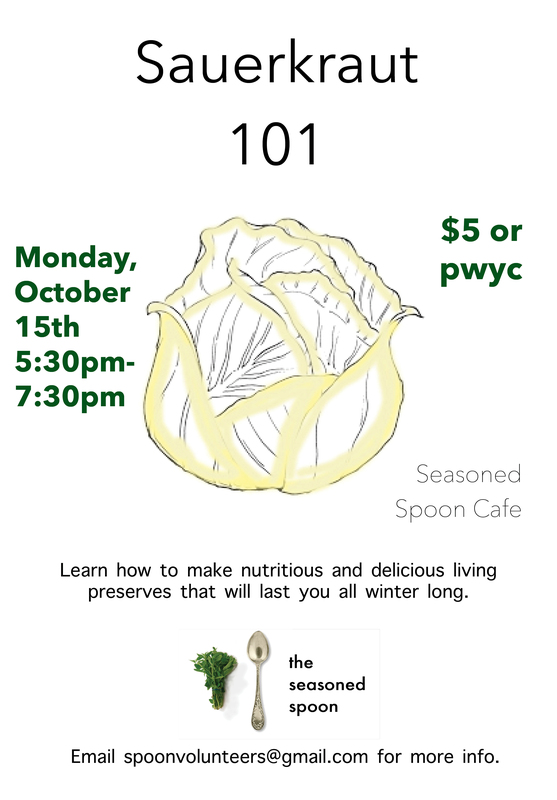 Using traditional recipes and fresh fall produce from the Trent Vegetable Gardens, this workshop will teach you how to make your own super nutritious and delicious fermented veggie preserves that will last you all winter long. A staple for any local food lover’s fridge. Email spoonvolunteers@gmail.com for more info. Join the Seasoned Spoon Café, the Flint Corn Project and the Trent Vegetable Gardens for a festive fall feast and community gathering. 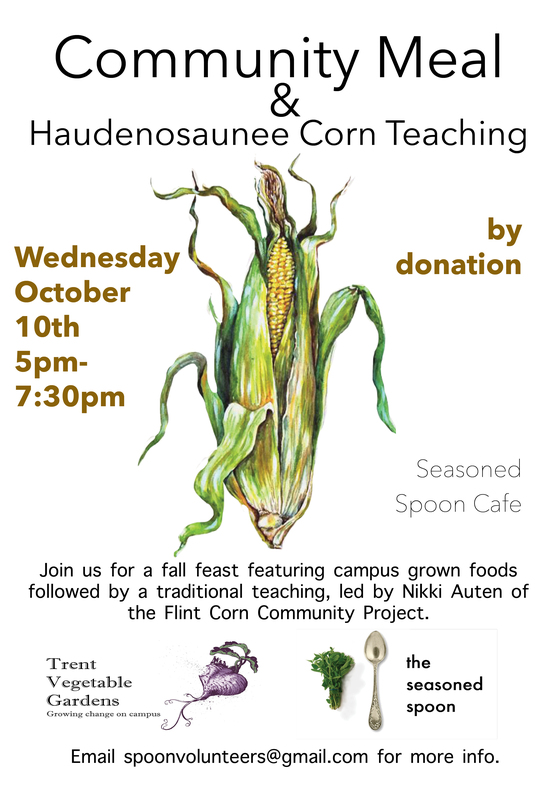 This special meal will showcase Haudenosaunee flint corn, in conjunction with a variety of squash and beans, grown in the traditional three-sisters mound method right here on campus in the Trent Vegetable Gardens in partnership with the Flint Corn Community Project. Following the meal, Nikki Auten, manager of the Flint Corn Community Project and Master of Arts student in the Sustainability Studies program at Trent will share traditional teachings about Haudenosaunee corn and its significant as a main staple of the Haudenosaunee food system.